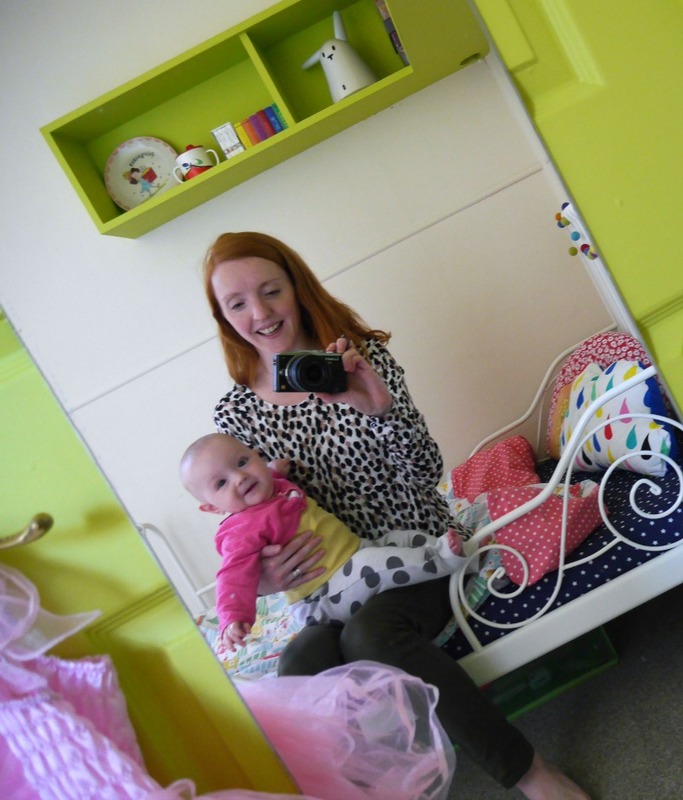 Eliza’s toddler room is one of my favourites in our house. 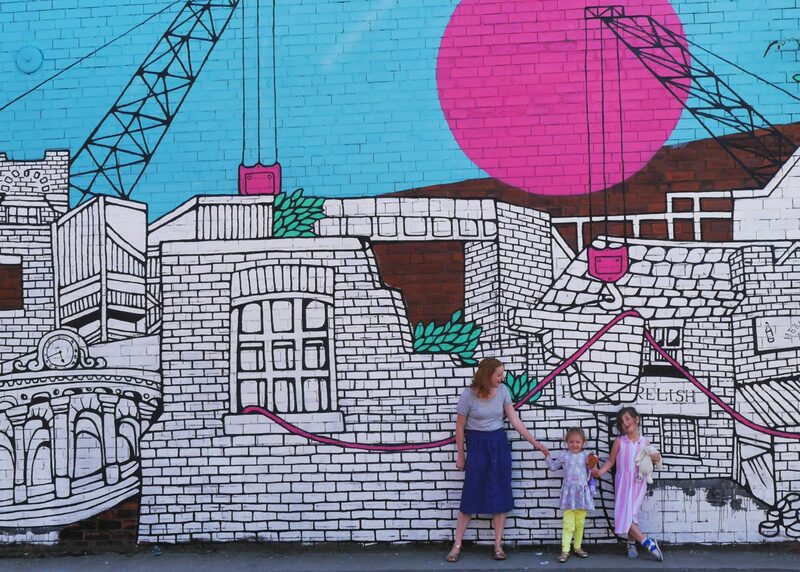 It’s bright, colourful and eclectic. I’ve been meaning to do a proper ‘room tour’ type post for ages because I love reading them (nosy) and in a couple of months she’ll be getting a Florence-shaped room mate, so it would be nice to have a record of how it is now. However, I’ve still not got round to doing that so in advance of a full tour, here’s a mini corner of her room. So what’s in this corner of her room? We wanted a fairly neutral but bright room that would grow with her, with no overall theme, cartoon characters and not too much pink. We went for the fairly fail-safe combination of neutral off-white walls and a grey toddler-proof carpet (in the other half of the room there’s a huge wardrobe under the attic stairs, the original iron fireplace and shelving in the alcove where her chalkboard wall and reading corner is). The previous owner of the house loved (seriously, loved) putting up shelves and cupboards everywhere. 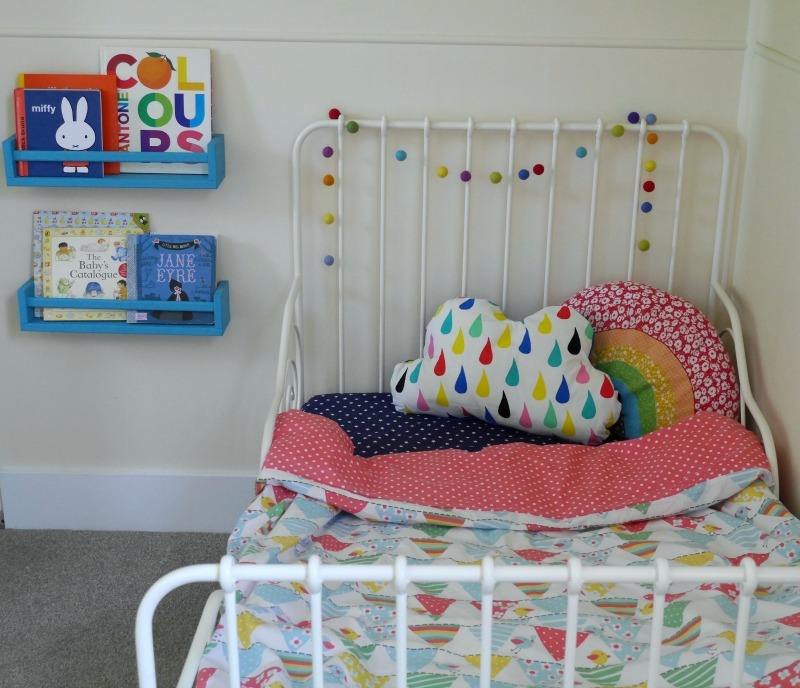 We’ve ripped most of them out – including the weird built-in bedside table – but left in the box shelves above Eliza’s bed. 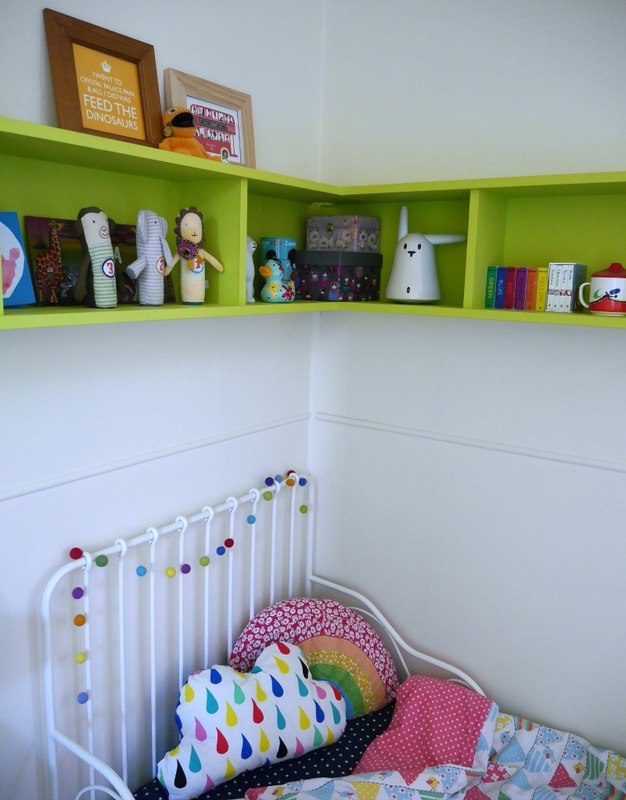 We painted the shelves bright green – along with her door – and use them to store all of her treasured and precious things. 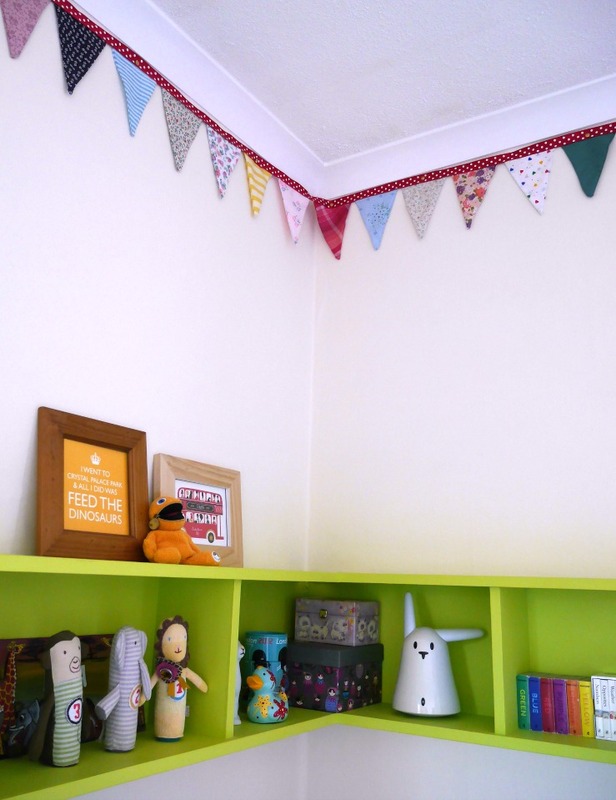 The bunting was made out of my old childhood clothes by me and my mum when I was pregnant. 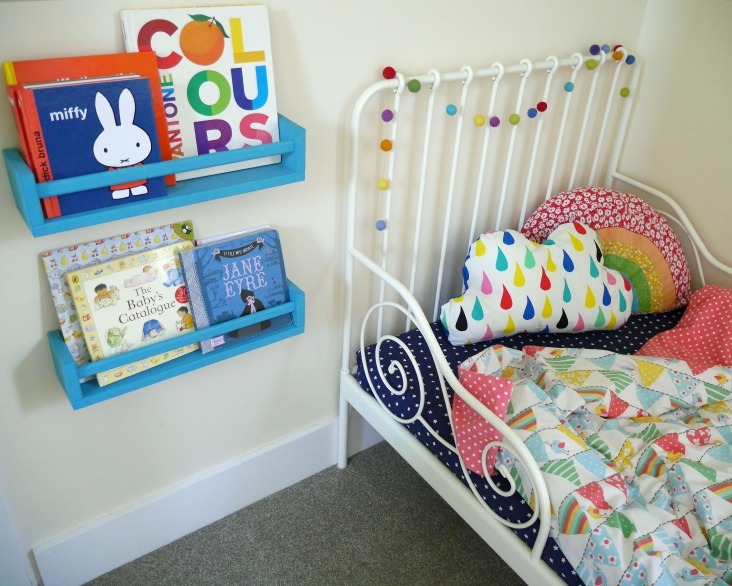 And there are her blue Ikea spice rack bookshelves by the side of her bed to store some of her books. She has a lot of pictures on the walls already, but these guys are waiting to go up. 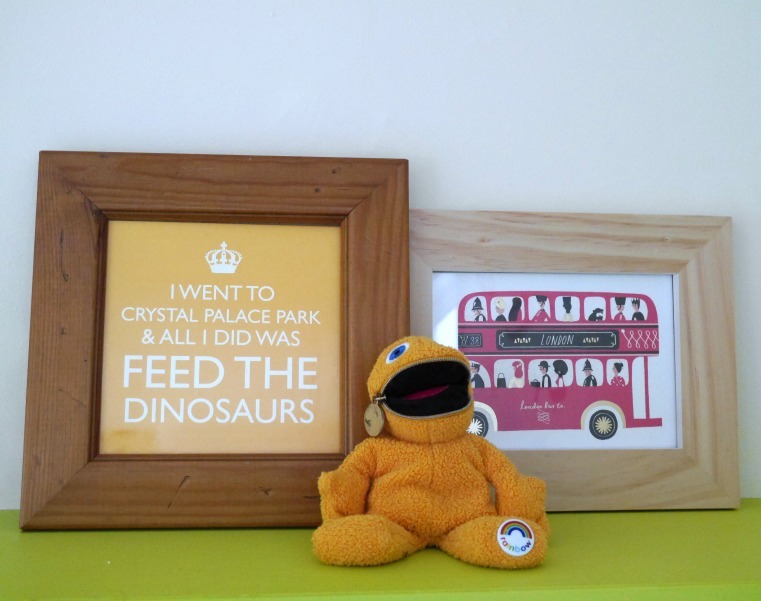 There’s a Crystal Palace postcard and London bus (with my old Zippy). 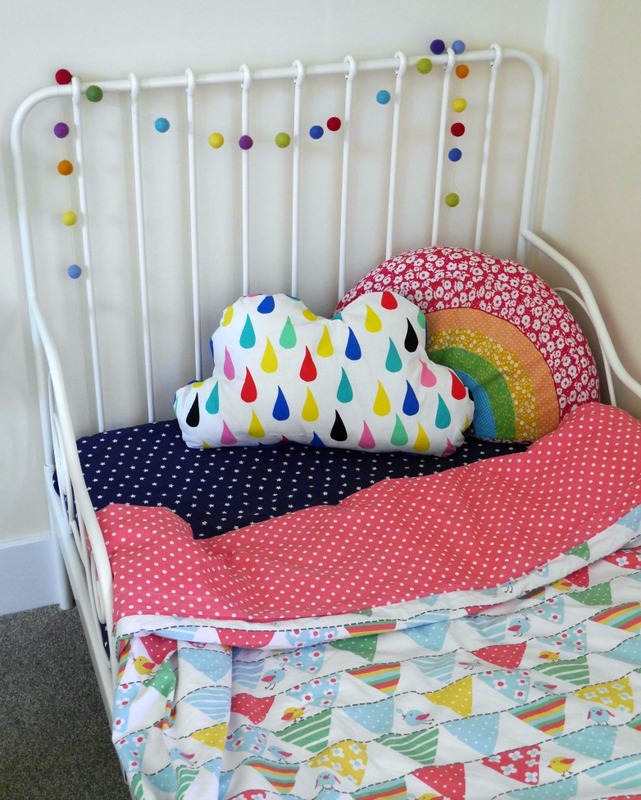 We were also sent some new bedding to review from Frugi, makers of children’s organic clothes. Eliza picked the bunting design in organic cotton. There are three different designs – animals, dinosaurs and flags – in cot bed and single bed size, and each set contains one duvet cover and one pillowcase. They’re all fun and fairly gender neutral. Eliza absolutely loves the bedding; she calls it ‘warm and soft.’ I like that it’s colourful and fun, but not too garish or cartoony. Don’t put it in the wash with anything pale though (I did, and it dyed everything an interesting shade of pink). The cloud cushion is one of her Easter presents, from Tiger, and the rainbow cushion is from a shop in Crystal Palace. I made the felt ball garland in matching colours to go on her bed. Her bed is the IKEA minnen (a toddler-sized bed that expands to a single). 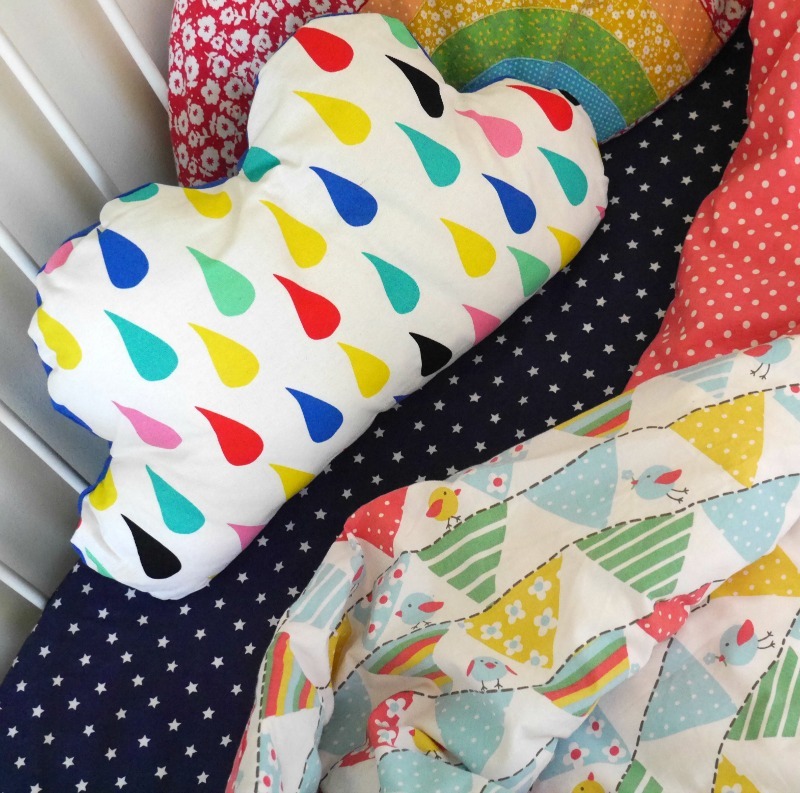 We were sent the Frugi bedding set to review for this post; it costs £59 for the single set. I love Frughi clothes for the kids, they do nice non garish brights but I’d no idea they launched into bedding. I’m going to have to sit on my fingers until Pip is big enough for a duvet!! I love that there’s such a personal story behind the bunting! Hey lady, would you like to design MY room? 😉 Because I could live amongst all of that colour quite happily! It’s truly gorgeous. Great job! I love this specially the bedding.